the emerald plaza, by emergent architecture deals with the problem of urban space in the hot climate of abu dhabi. the project is based on creating continuity between three elements which were outlined in the design brief: a garden, central sculptural volume and network of canopies. 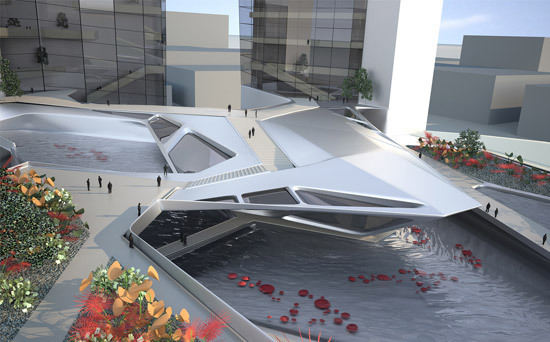 the landscaped garden roof, acts as a canopy, offering shade to the walkways below, but also connects surrounding buildings with one another. pools inside give the feeling of a grotto and also have a cooling effect, providing a getaway from the hot environment.